When I was getting to the end of school, I didn't really want to do year 12, but I thought it was a good idea to get my HSC. 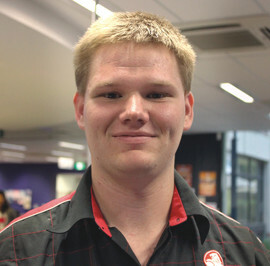 I found out that an alternative was to do a school-based apprenticeship, where I could start training for my apprenticeship and also get my HSC. I've always been interested in mechanics and how things work, and I’ve always had an interest in cars. So I chose an automotive apprenticeship, through CIT and Gerard Slaven Holden. I really liked CIT - I had heard negative things from other mechanics about their study through other providers, but I was really happy. The teachers were really well-trained, and the facilities at Fyshwick were great - we had lots of equipment to train on. Having had that hands-on experience really made me more confident in the workplace. I also really liked that it was self-paced. I didn't have to wait for the rest of the class to catch up - I could just go at my own pace and finish whenever I wanted. I have really enjoyed my studies. To me, it's more like a hobby. After finishing my apprenticeship I was keen to hone my skills, so I went to do the Certificate III in Automotive Mechanical Technology and the Certificate II in Vehicle Air Conditioning at CIT. In the future I would like to specialise in diagnostics, so I am now also completing the Certificate IV in Automotive Technology at CIT.